What plantophile hasn’t, at one point or another, hummed to their plants, or perhaps imagined a small face in the center of a pansie? And poets, since time immemorial have waxed about the amazing beauty and cunning of the natural world. We plant lovers “plantopomorphize” our favorite green companions by naming them (I once had a Purple Velvet plant named Nico). And who doesn’t remember that 6th grade science fair project that proves plants thrive when listening to classical music? Alice’s garden of flowers is a prime example of an imagined “language” and personality of individual plants. And of course there is the Secret Life of Plants, the book that claimed that plants have brains. And feelings. There have been stories in the press and other media about a small community in the north of Scotland called Findhorn where people talk to plants with amazing results—stories of vegetable and flower gardens animated by angelic forms where Pan’s pipes are heard in the winds—stories of plants performing incredible feats of growth and endurance: 40-pound cabbages, 8-foot delphiniums, and roses blooming in the snow. Plants have genes similar to those that specify components of animal nervous systems, specifically proteins that have been show to have distinct roles in neural function. While said proteins are likely to not have “neural” functions in plants, they are believed to behave in ways very similar to neural molecules. Some plants show synapse-like regions between the cells, where neurotransmitter molecules facilitate cell-to-cell communication. Say what, you crazy rotanist??? Basically, plants have their own “version” of nervous system. And if you want some more scientific proof for what Bird, Tompkins, Hawkens (and before them even Darwin had a similar theory) are saying about plants having “feelings” a recent study with peas might give a little more validation. Peas, when stressed from drought, close their “pores” (known in botany as stomata.) The study showed that a non-stressed, well watered pea plant whose rooted near by a stressed plant will also close its stomata as a precaution. Yes, it gets the vibes of stress! Of course this is all basically scientific evidence of what shamans and plant magic workers have been saying since we had teeth. 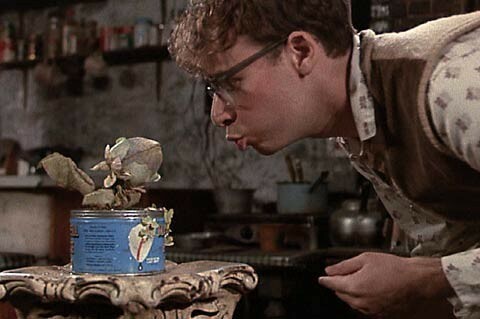 So maybe there is a real-life Audrey II out there, waiting to get its “jaws” on us. One that thinks, feels, longs, yearns…a rotanist can hope! 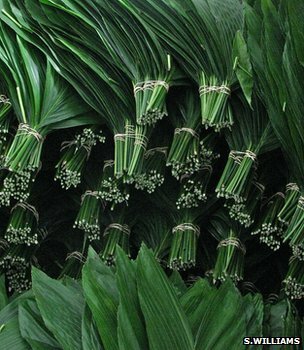 The globular-leafed, green little bunches are synonymous with Christmas cheer of a very romantic variety. But mistletoe may well be more than just an excuse to steal a kiss: this parasitic little plant could contain the cure for colon and other cancers. “Mistletoe” is the common name for a hemiparasitic (semi parasitic–a plant that gains nourishment from the host plant but also photosynthesizes) plant of several families (all within the order Santales.) Some of the most familiar plants we know as mistletoe are the common European variety, Viscum album and the North American species, Phoradendron serotinum, both of which are widely harvested as Christmas decoration. Yes, you read that right. More potent against cancer cells than the chemotherapy drug. It also has fewer side-effects and is gentler on the system. Scientists, herbalists, and ethnobotanists have been studying mistletoe for years. 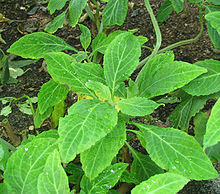 It is known to be poisonous, causing stomach pains and other intestinal distress. For centuries the stems and leaves have been used to make an extract to treat sluggish circulatory systems and major respiratory problems. Rudolf Steiner, the founder of Anthroposophy, pioneered the concept of mistletoe as an anti-cancer medicine. A spiritual botanist, Steiner believed that the parasitic nature of the plant could counteract the parasitic nature of a disease like cancer. It turns out he was right. Scientists have been studying mistletoe’s many varieties for years. 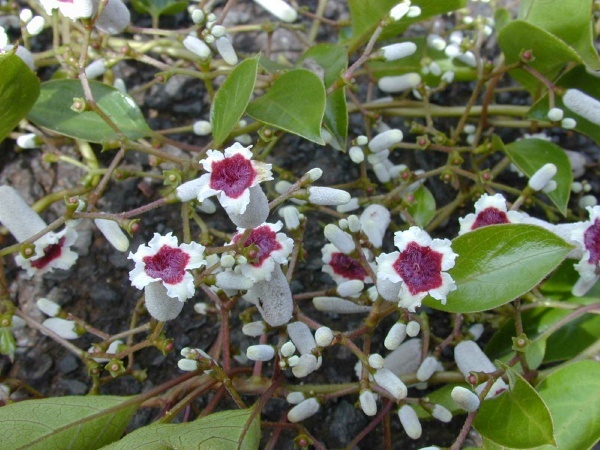 In this article published the National Center for Biotechnology Information, U.S. National Library of Medicine, you can see photographs of a tumor virtually disappearing after six months of treatment with the fraxini extract. Researches at University of Adelaide in Australia extracted three different varieties of mistletoe, all from the Viscum species. Each variety grows on a different kind of tree. The one that grows on the Ash tree so far has proven to be the most effective. However, there are hundreds upon hundreds of types of mistletoe. The potential is actually quite astounding. In Europe, mistletoe is already being used in the treatment of colon cancer but not it is currently not legal in the United States or Australia, where research is underway to approve it. Mistletoe is steeped in mythology. Viscum album is thought to be The Golden Bough–the branch that Aeneas must give to the Queen of the Underworld in the epic Greek myth. The Romans believed mistletoe contained divine male essence. The Ancient Druids believed the most sacred mistletoe to be the one that grows on oaks. The Norse believed mistletoe contained the power to resurrect the dead. I recently scored an interview with the most horticulturally minded person I know, Bill Barnett. Bill is the manager of Sloat Garden Center on 3rd Avenue (at Clement) in San Francisco. I first met Bill when I was his underling at the retail nursery. Those in the know, know that this branch of Sloat Garden Center is a secret oasis of rare and thriving gems. There is no plant, odd or otherwise that Bill doesn’t know about. I’ve tried to stump him and only come close once: I found out about a new hybrid of a dianthus about a week before he did (score one for the Rotten Botanist!) Bill knows more about plants than any other human alive. Seriously. And he doesn’t hold a PhD or even a master’s in horticulture. Bill got his knowledge the old-fashioned way: immersion. He has discovered a species and trained me in the ways of the weirdest plants. He introduced me to Black Mondo Grass, for which I am forever grateful. He is also a master diagnoser of plant diseases and a damn amazing cook. Bill is pretty old school. I did this interview with him via mail. That’s right, MAIL. Not email. He hand wrote the answers, complete with a tiny botanical illustration of a pitcher plant he is fond of. Probably the only way he’ll read this interview is if I print it and bring it into him. RB: What is your earliest garden or plant memory? BB: As a toddler I can remember my mom’s houseplants. My aunts all had the same ones because they traded cuttings. They all had the Achimenes — a member of the African Violet family that goes dormant int he winter. My mom believed that you needed to water it with hot water in the spring to wake it up, but of course you don’t. Everyone just called it the hot water plant. My mom also bought houseplants that were reduced in price at the grocery store because they were fading. They rarely looked any better under her care. RB: How long have you worked in the horticultural field? BB: Too long. I have seen evolution occur. 34 years. And I really do believe that plants propagated from plants that “like” captivity have produced progeny that are much easier to grow, in just a few generations instead of eons. Or maybe I’m just a better grower–whatever. RB: What is your favorite plant (indoor or otherwise)? BB: I love the Staghorn ferns–all 18 species. There’s nothing else like them. They have the shield leaves that stack up as they grow. The inner shields become compost for the roots and they funnel falling leaves and rain to the roots for even more compost. Another type of leaf hangs into the air and look like the staghorn or antler. BB: The Fo-Ti that Pixie planted against the North wall. [Rot Bot note, Pixie is a former colleague and amazing gardener who currently works at Annie’s Annuals. Tell him we said ‘Hi!’] We’ve pulled all of it on this side but it still comes in from the neighbor’s yard. It comes through the drainage holes in the flower box. One tendril found the drainage hole of a pot sitting on a shelf and rooted into the hole. We all now hate it. It taunts us through the fence. RB: Is there a particularly bizarre plant that you think Rotten Botanists should know about? BB: I bought the weirdest plant from a grower from the Philippines at the orchid expo this year. It’s a fern called Lecanopteris carnosa or the Ant Fern. It is an epiphyte. The base looks like a green potato and seems to have hardly any roots. The leaves are pretty fern like. It likes to grow in the sun and get bone dry between soakings. The base grows in one direction and as it does the rear portion dies and becomes dry and black and hollow. Stinging ants move into the backroom. They’re not squatters–they work for their lodging. At any vibration from something munching on the leaves they rush out en mass and run the invader off. They groom the leaves of any aphids or scale and they fertilize the roots by dumping all of their food scraps and poop in the yard. My plant is growing well, without ants. RB: Rumor has it you discovered a species of Sanseveria (snake plant). Can you tell us about that? RB: If your house was on fire and you had time to save just ONE plant, what would it be? Why? I’ve got plants that it would be harder to find or more expensive to replace (if possible). But I love my little Australian pitcher plant, Cephalotus follicularis, so much. It’s a nice clump of the miniature pitchers. They all face away from the center of the group. It looks kinda like a nest of baby birds all with their mouths open for feeding. I feed them frozen baby crickets. A random photo from the interwebs. I will upload photos of the stranglers I saw in So America once I get around to scanning them. The trip was prior to the digital age. Sound like something from a horror movie? Well, its behavior certainly is. 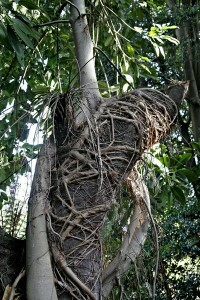 The rotten habits of the Strangler Fig have earned this type of Ficus its dastardly nick-name. Strangler Fig is a common term for several species of Ficus that grow in tropical and subtropical forests throughout the world, and the term can even be used to refer to any vine that exhibits the behavior similar (sucking the life out of its host plant while it thrives). As there are more than 150 species of Strangler figs in the New World forests alone, I’m going to focus mainly on the ones in Central and South America. Several years ago, on an ethonobotanical sojourn to a Peruvian rainforest, the tale of the Stranglers was relayed to me by one of our local guides and has haunted me ever since. In the competitive world of the tropical forest, sunlight and compost are hot commodities. The Strangler fig has figured out exactly how to get what it needs.Once the animal has left behind the seed, which is now nestled in a crook of a tree covered in fertilizer (aka animal feces) it is only a matter of hours before it starts to thrive. Slowly it grows roots, which begin to reach down toward the soil below. The roots can grow hundreds of feet long, and eventually form a lattice-like network around the tree’s trunk and into its root system. It also grows up toward the sunlight, eventually shading the host tree from sunlight. In this way the Strangler fig is slowly but surely strangling the life out of its host tree. It is robbing the nutrients from the ground, gobbling up the sunlight above, and using the structure to wrap ever tighter and grow ever larger. More often than not the Strangler Fig kills its host, though some have shown enough mercy to let the host tree live–though it is only a shadow of the life they once had. You wouldn’t necessarily notice if you strolled by one. You might just think you see a big, beautiful, healthy Ficus tree. But upon closer inspection you’ll see the “trunk” is a network of roots, its support being the carcass inside. Strangler figs do play an important role in the ecology of forests, including providing rotanical homes for bats and other small animals as well as food for a wide variety of species. A very wonderful and menacing plant in the kingdom of Rotten Botany. This is a very interesting article and a topic of discussion for many years now among floral designers and gardenesses and even herbalists who advocate against wildcrafting. or Purple Tomatoes: Not Just for Heirlooms Anymore! Purple tomatoes you say? What’s the big deal? The heirloom varieties such as ‘Black Prince’ and ‘Purple Cherokee’ have been tumbling across market stands and making their way to our tables for a number of years, delighting foodies and gardeners alike. So what on earth is all this horticultural hullabaloo about? This tomato doesn’t tumble or stumble. This baby waltzes. The Indigo Rose, unlike the aforementioned varieties, is not an heirloom variety but more of a freak of nature–a carefully crafted freak, that is! 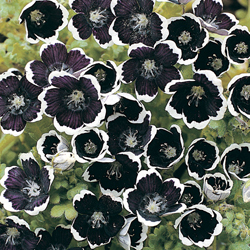 It’s a fun new hybrid, and it has a very distinct difference from the other varieties. 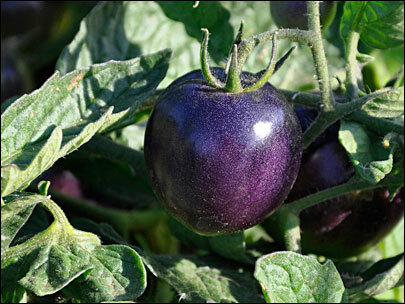 According to an article published by Oregon State University, whose horticulture department is responsible for the mad-creation of the ‘Indigo Rose’ variety, tomato fruits like ‘Black Prince’ and ‘Purple Cherokee’ get their color from various reactions within the tomato’s chemical makeup that results in a the green-skin gene producing a darker color. What causes the purple pigment? A class of compounds generally called anthocyanin. The specific anthocyanins present in the tomatoes are mainly petunidin, but malvidin and delphinidin are also present. The anthocyanins are modified by the presence of acyl (sugar) groups. Anthocyanins are a member of a larger class of compounds called flavonoids. Other members of this class include quercetin, kaempferol, naringenin, catechin, and isoflavones. Phenols or Phenolics are related compounds that differ in basic chemical structure, but have similar function. In our tomato lines many different kinds of phenolics and flavonoids are up regulated along with the anthocyanins. Well, in a nutshell, the Indigo Rose has a purple-skinned gene rather than the typical green gene. This is the result of a high level of compounds known as anthocyanins, most commonly known as the compounds that give blueberries their nice, dark blue color. Let’s face it, this is a true rotanical of the most Frankensteinian proportions. I’ve heard it doesn’t taste as good, falling short in flavor (but where it lacks in flavor, it makes up for in flavonoids)but as soon as I can sink my teeth into one, I’ll be the judge! Were genetic engineering techniques used to develop these lines? No, conventional crossing and selection techniques are being used. This is perhaps the most misunderstood aspect of this project, and we will say it again: These tomatoes are NOT GMO. That means that they isolated naturally occurring genes from other plants and isolated them, combined them, and intensified them. Genetically modified organisms use new genes and sometimes new made-in-a-lab genes. This kind of isolating and breeding technique has been used for centuries, and in fact, many “heirloom” varieties are the result of hybridization. Just wanted to add a line in there in defense of this lil’ freak! Check out the Territorial Seed Company’s online catalog description and see for yourself if you’d like to order some! 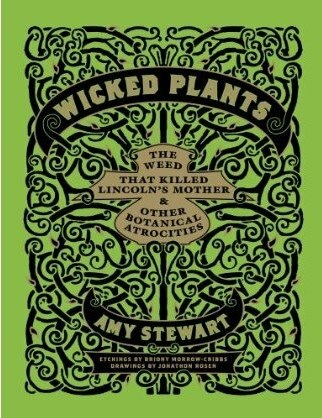 For all you fans of the rotten, stinky, beautiful, wicked plants in the world, if you haven’t somehow yet heard of Amy Stewart take heed! She is the author of Wicked Bugs, Wicked Plants, Flower Confidential, The Earth Moved, From the Ground Up, and a forthcoming book called The Drunken Botanist. She writes blogs called Dirt and Garden Rant. She is fun, punchy, and incredibly knowledgeable. 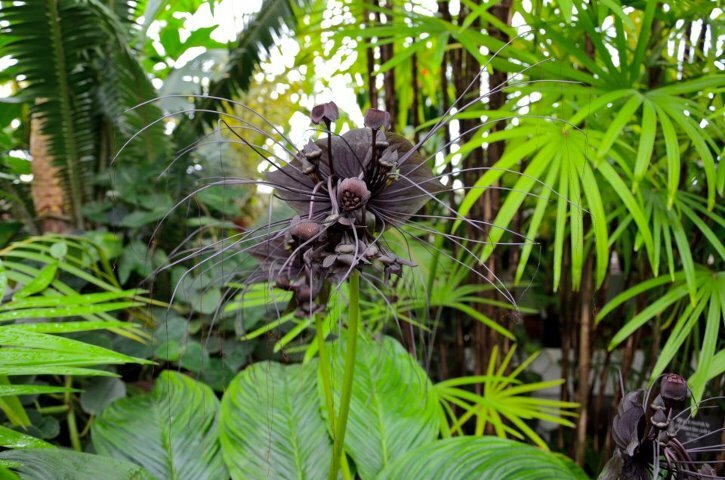 Her book Wicked Plants has been touring the country in the form of exhibits at botanical gardens and conservatories since it first hit the stands. Once I read Wicked Plants I was hooked and went back to read nearly everything she’d written. Amy was gracious enough to recently grant me an interview for Rotten Botany. Read on for a few words from Amy about the most beautiful and low-down rotanicals she fancies. What is your favorite plant (wicked or otherwise)? I am a big fan of salvias of all kinds–there are many species native to California that do really well with no effort at all. I love the colors, and the fact that they are so tough and drought-tolerant, and the fact that they attract a lot of hummingbirds and bees. I probably have 30 or 35 species in my garden. What is your favorite poisonous plant? 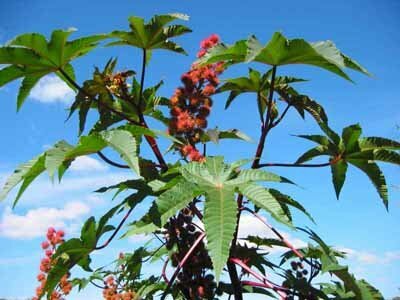 I really love castor bean–it’s gorgeous, very dramatic, quite frightful-looking–and the seeds contain ricin, one of the most deadly poisons the plant kingdom makes. Just a few seeds, chewed well, could kill a person. What do you think is the most dangerous plant? In terms of the number of people it has killed? 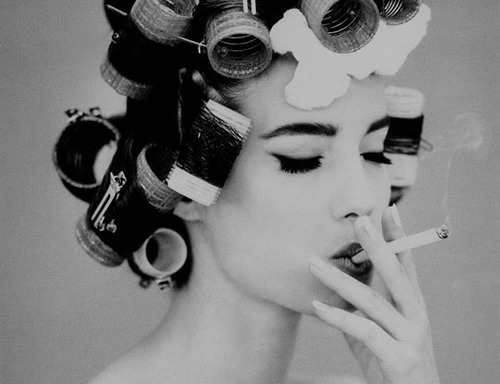 That’s easy–tobacco. Over 90 million people have died because of that plant.